When life gives you lemons, make lemonade. When life gives you 2 1/2 kg of organic bananas for £2, make banana bread. Remove the top shelf rack of the oven. You can replace it when the oven is cold again afterwards. Preheat oven to 180C/160C/Gas Mark 4/350F. Grease a 2lb / 1kg loaf tin and line the base. Mash bananas roughly with a fork in a large bowl. 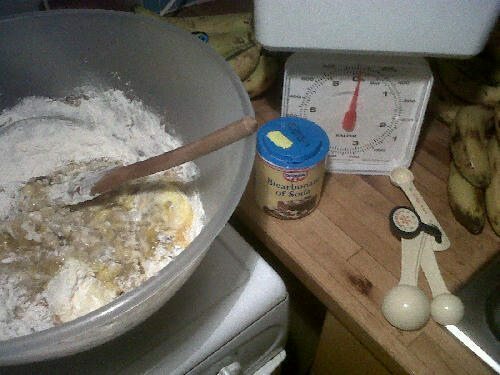 Add eggs, softened butter, sugar, sifted flour and bicarbonate of soda. Mix well and add in walnuts and combine. 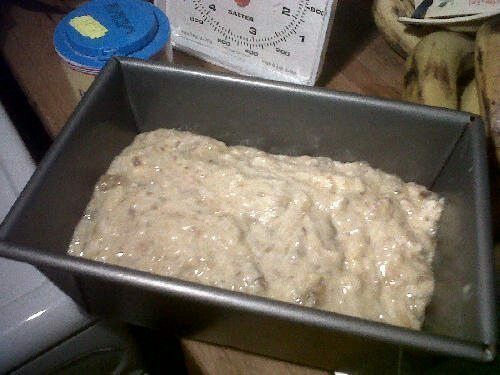 Tip the banana bread into prepared tin and bake for 1 hour – 1 hour 15 mins on the middle shelf. When the cake is nearly cooked, take it out from the oven and cool in tin. The cake will finish cooking in the tin. 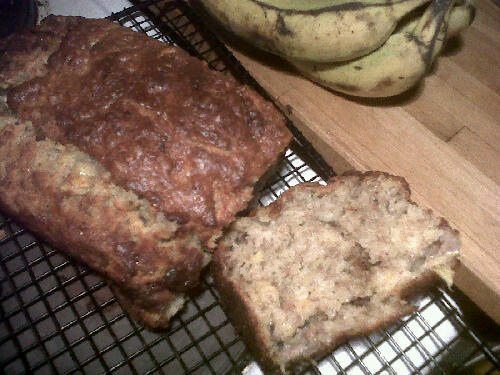 We recommend that the banana bread is kept for a day before serving, but it never makes it that long in my house. I’d make double quantities as it freezes and keeps well. US conversion – Oven temperature of 350F. Self raising flour is self rising flour. Bicarbonate of soda is baking soda. Dairy free – Use dairy free margarine instead of butter. Nut free – Omit the walnuts. Bio – Rosie Slosek runs The Money Haven, supporting one man bands in the UK with hassle and fear-free accounts mentoring, with a home made brownie for every client. She is passionate about cake being an important part of self motivation. Start your week well and sign up for her free Accountability email every Monday morning at 8am.